I've been working on more research for Laurelhurst trying to fill in some of the later history. In my search, I am always looking for more details about Ida McCain and her family. For those who have recently joined our blog, Ida McCain is the woman who built our house in 1911. First off, I am grateful to the Multnomah County library which provides access to the paid NewsBank service for free. Also, another site that rocks is Historic Oregon Newspapers, which includes good quality scans of the papers. So, I was able to successfully search for newspapers in NewsBank, which had fairly low quality scans, and when there was pictures, I could go to the University of Oregon site and look up the date and download the pages. I'm not going to repeat all my earlier information, but I do want to add more details I found in the last week during my latest bit of delving through old Oregonians. I'm not going to include pictures of the houses as I've already published them in an earlier post. Ida McCain came here with her family and formed Spencer-McCain in mid-1909. 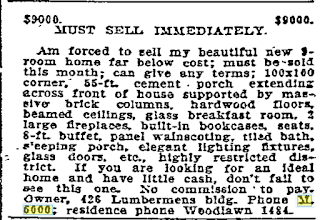 The earliest ad I found was May 27, 1909. They were advertising daily for work and got some. It looks like they designed a house for E.L. Pope. I don't know if they actually built it. I have no record of her working out of Oregon City. I did look up Pope and he ended up being sort of a big deal. He lived in Parkplace and ended up a judge. They did get a building job in Portland. They pulled a permit on the 27th of August: “Talbot Road, near Summit Avenue--R.W. Shepherd; builder Spencer, McCain & Co.; erect two-story frame dwelling; $4500.” This house is located at 2647 SW Talbot Rd (was 761 Talbot Rd). On the 14th of September they pulled a permit for H.C. Hutchinson, 1½ story frame dwelling, E 59th Street, between Stanton and Alameda; Spencer-McCain builders; $2000. This house was in Rose City Park and is now gone, replaced by a commercial building. That project was followed by one for Mrs. F. Hibbard. 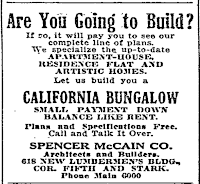 "Tues, Dec 28—Erect two-story frame dwelling, East 63rd Street between Siskiyou and Sandy Road; builders, Spencer McCain Co.: $2000. This house is located at 3033 NE 63rd Ave" (was 655 East 63rd North). Around the same time, Ida McCain got the gig for building C.K. Henry's and H.I. Keeney's houses. "The Spencer-McCain Company has been commissioned to prepare the plans of the new home of Charles K. Henry in Laurelhurst Addition. It will be a broad, rambling cottage, and will be erected in the mostly sightly place in this addition this Spring." Anyway, Spencer-McCain must have made some money on these projects because by February 1910, they bought two lots in Alameda Park and commenced building two homes. One was for her brother, Arthur McCain, and they told the Oregonian the second was for her mother Hannah King. (I've only found the one permit, so far.) They reported that the houses would be finished by March 1st, but it seems pretty unbelieveable that they could build houses so quickly. Arthur's house was located at 2817 NE Dunckley St (was 865 Dunckley). On 5 May 1910, they pulled a permit for Charles McClure. "Thursday, May 5—Erect one-story frame dwelling. 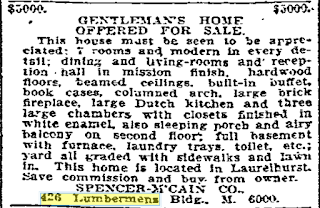 Huron street, corner Dawson; builder, Spencer McCain Co.; $1600." This house has sadly been demolished and replaced by freeway. 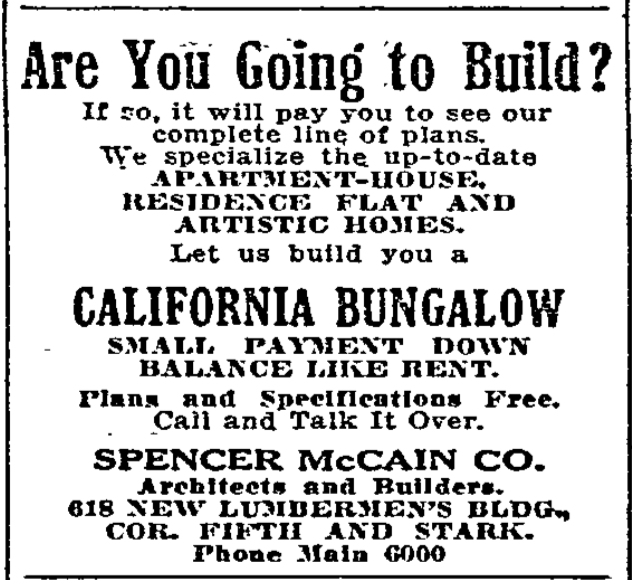 On 8 May 1910, they announced a house in Colonial Heights: "The Spencer-McCain Company has prepared plans for a two-story nine-room residence for Dr. Amelia Zeigler to be built on Colonial Heights, near Hawthorne Avenue to cost $5000. The foundation and columns of the porch will be of cement blocks." Originally 297 E 23rd in 1912, now 1617 SE 23rd Ave.
On 13 Jun 1910, they pulled the permit for Charles K. Henry's house. "Erect two-story frame dwelling. Laddington street between East Glisan and 39th; builder, Spencer-McCain Co.; $20,000." By the summer, they certainly had the second Alameda Park house, for Hannah King, complete. It looks like they occupied it as they list its address in the 1911 Portland Directory: 4063 NE 29th Ave (was 875 East 29th St. North). They continued to list the house for sale in the Oregonian. 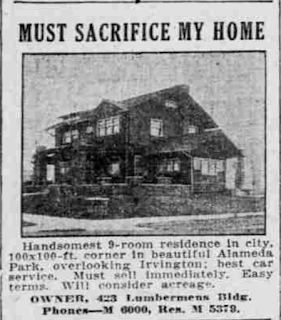 By October the Alameda Park house was still for sale and they were starting to sound desperate in their sales ads. Both the Henry and Keeney houses are completed by Feb 1911. "Erect two-story frame dwelling. Senate street, between East 35th and 37th; builder, Spencer-McCain Company; $3800." 3641 NE Senate St (was 1081 Senate Street). In one of the Oregonian reports they claimed the house was being built for E. Spencer (Ida's sister), but I don't know if she ever occupied it. "Erect two-story frame dwelling. Multnomah street, between Peerless avenue and Imperial avenue; builder Spencer McCain Company; $4200." 3391 NE Multnomah St (was 1035 Multnomah St). In March, they're still advertising the Alameda Park house. They claim it's listed $3000 under cost. "Absolute sacrifice of my beautiful ten-room home in the most restricted district of city, to meet other obligations Apr 1; hardwood floors, beamed ceilings, panel wainscoting, built-in buffet, sunken den, French doors, 33-ft cement porch on 100 ft. corner; best car service in city; this home must be sold and is offered at $9000, $3000 under cost; easy terms. See owner, 426 Lumbermens bldg., or phone M6000." 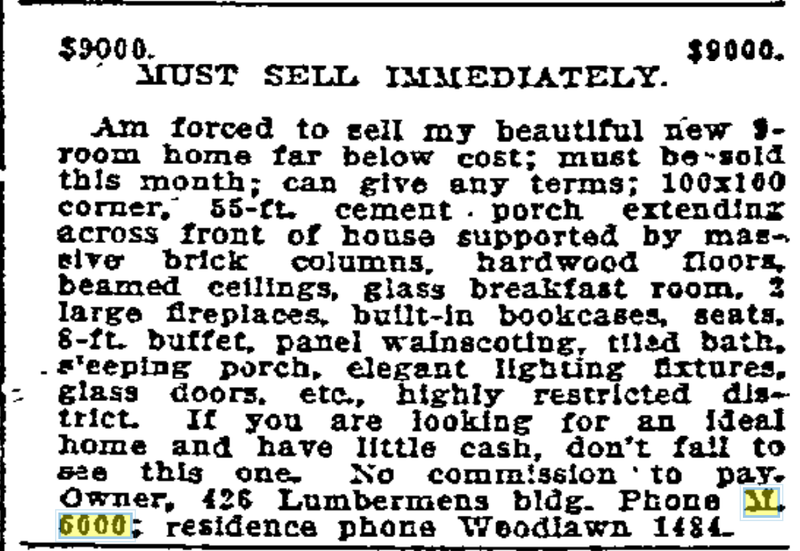 I'm confused about another ad I found from May 1911 with their address and phone number. "Wanted—$4000 for $9300 property, Portland Heights. 426 Lumbermens bldg. Phone M6000." It looks like it may be the house they built for Shepherd in Portland Heights back in 1909. They offered to loan money for building purposes in the summer of 1909, so perhaps he reneged on his mortgage. If so, that certainly didn't help their cash flow or profit margin. Though, based on the earlier estimates of the project, I wonder if they were being completely honest about it being a $9000 project. The original permit said it was a $4500 project. At this point, the projects for specific people seem to stop and they start building on spec. 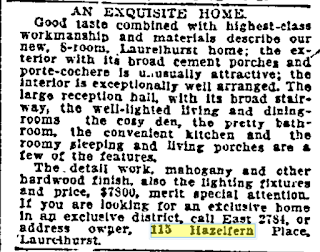 By June, they are advertising the Laurelhurst house on Multnomah for sale, as well as the house they still have in Alameda Park. Honestly, I'm thinking they decide sometime in late 1911 or early in 1912 that they're going to wrap up their business in Portland. They had good success on spec homes in Laurelhurst, so they decide to build their last three lots. By September, they appeared to be selling off personal possessions: "If taken immediately will sell my beautiful new Melville-Clark Apollo player piano, for $335 cash; cost $750. Owner, 426 Lumbermens bldg. Phone M6000 or Woodlawn 1484." I think they must have also put the Senate street house up for sale. They just needed to sell some homes; any homes. In October, the house on Multnomah sold to Frank E. Manning for $6000. The Senate street house sold to W.L. Simpson for $5000. The Alameda Park house on 29th Ave. was still for sale in Sept 1911, more than a year after they completed it. They advertised heavily for months trying to sell this house. 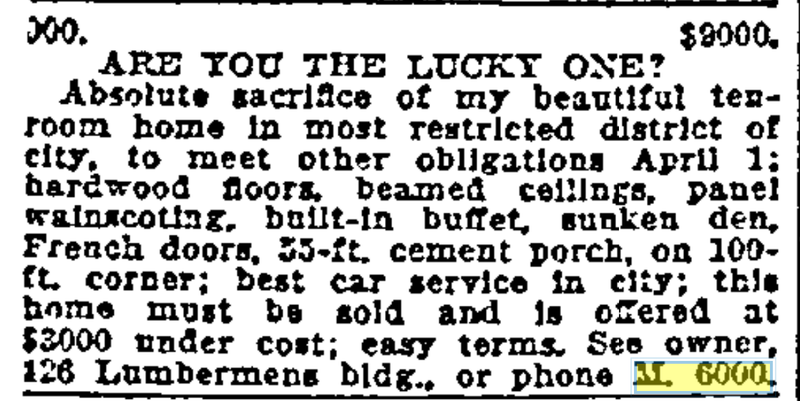 They even offered it for rent in October 1911. In January 1912, I believe they closed their commercial business office; they sell off their drafting tables and office furniture and move into one of their houses. 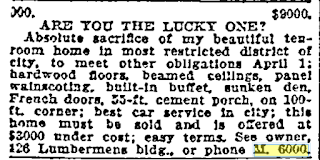 In March 1912, they tell a reporter with the Oregonian that they'll be building on 7 lots during the summer. Sadly, this is their last summer building in Portland, they've largely given up trying to advertise themselves to prospective clients. The Oregonian has very little to say about Spencer-McCain in 1912. They seem to be trying to cut their losses and get out. They finish houses at 444 NE Floral Place (was 106 Floral Ave), 436 NE Hazelfern (was 116 Hazelfern) and 475 NE Hazelfern Pl (was 115 HazelFern). On 5 Aug 1912, they appear to have transferred two lots back to the Alameda Trust Co. I guess after the earlier loss, they'd changed their mind about building there. 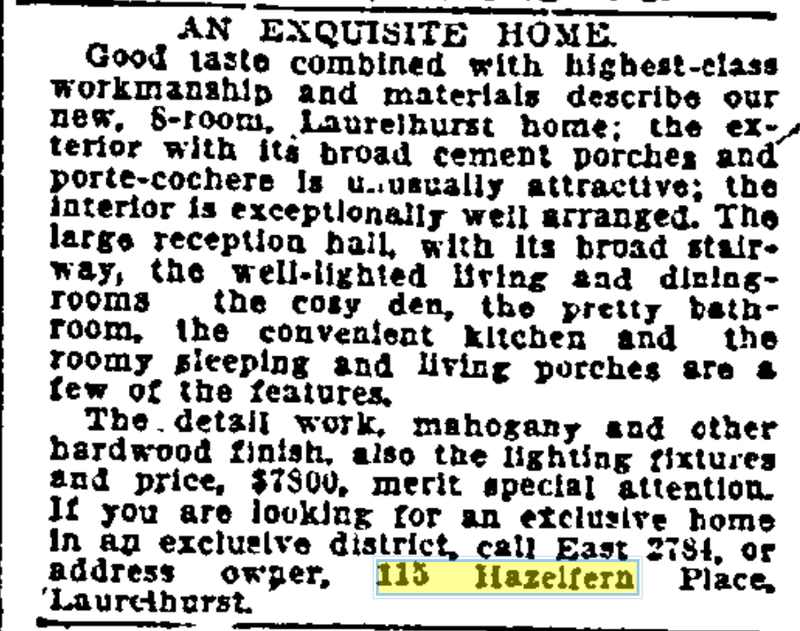 During 1913, Ida McCain lives in 115 Hazelfern house while she tries to sell it and the other houses. She pleads in ads for folks to come take a look because she has to leave the state. 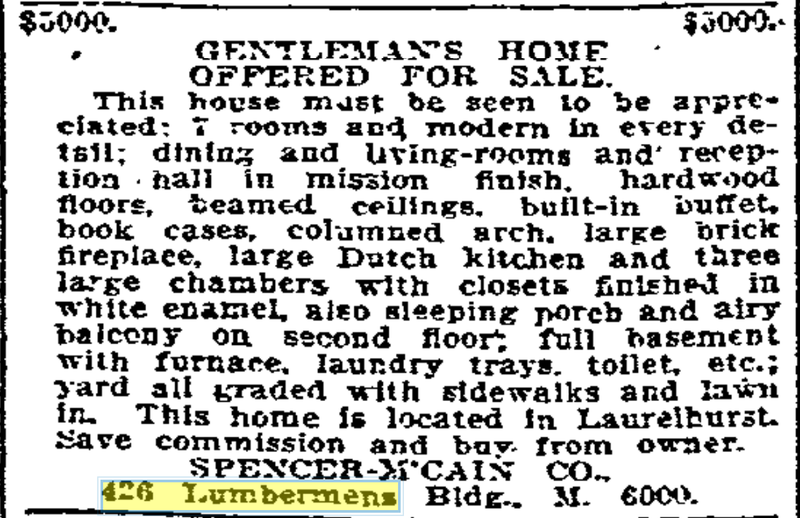 The last ad I found from Ms. McCain in Portland was on Jun 5, 1913. By 1914, she shows up in the Los Angeles directory. I'm not sure how long Arthur W. McCain stayed in Portland, but by 1915, he is in arrears on his property tax on his Alameda Park house and he has a Vallejo, California address. I haven't found a sales record (yet). Based on these ads, I get the impression that they just overbuilt their resources. They had some early success but then they got a little too enthusiastic about their prospects. Speculative houses took longer to sell than they expected, and they couldn't afford to wait. Since they had to sell them quickly, they ended up taking some pretty deep losses. In the end, I think they just couldn't afford to stay in Portland.